"It was from this waterhole that Lasseter and Harding re-discovered the show". Located on the north eastern slopes of Mount Ant, between the Walter James Range to the north and the Scherwin Mural Crescent to the south, at 128°45'E, and 25°45'S, on the NATMAP 1:250.000, Rawlinson sheet No.SG52-2. The Giles Meteorological Station is situated approximately 55 kilometres to the WSW, and Kaitukatjara, The Docker River Aboriginal community, a little over thirty kilometres to the ESE. In that remarkable book, 'Lasseter Did Not Lie', Stapleton considers the possible locations of that "all important factor: the place where Lasseter and Johns quarrelled, fought and parted company; and whence later Lasseter's camels bolted". Stapleton reasons that Lasseter's reef is two days camel ride from this place wherever it may be. Of course any discussion on the location and significance of this place is academic, but Stapleton's search is an interesting exercise in creative history. There is only one source of information regarding events in the Petermanns and that is Paul Johns hurried verbal report to Coote immediately prior to handing Lasseter's letter to the Government Resident on 12/11/30. Coote reports seeing this letter yet despite an extensive and professional search Lasseter's letter to Carrington cannot be located and somehow that is not surprising. Idriess of course interviewed Coote and records his version of Johns report fairly accurately, not so Stapleton. As recorded by Coote, Johns told how he and Lasseter had struggled through the Petermanns, in country so wild and broken that camel travel was slow and difficult. They eventually moved into swampy country where it was impossible for the camels to travel any further. Lasseter left Johns with the camels and went on alone and on foot, and was away for two days. On his return Lasseter stated that he had found his reef and had sample bags of specimens with him that he refused to show to Johns. Johns thought Lasseter's story about relocating the reef "absurd" and called Lasseter a liar, ever ready to defend his honour, Lasseter attacked Johns who drew his revolver. In the ensuring brawl Lasseter managed to disarm Johns and throw the weapon into the mulga, they camped apart that night but came to a very cool arrangement next morning, sufficient to return to Illbilla. They left for there immediately and arrived on 29/10/30. So the best we can deduce from Johns, Coote and Idriess is that somewhere in the Petermanns, Johns waited for a couple of days in swampy country with the camels while Lasseter on foot, relocated his reef. No rockholes are mentioned, or named landmarks or specific directions, that comes much later, found under camp fires in sauce and pickle bottles. Stapleton makes his deductions based on the epilogue of Hells Airport, an enlightening finish to the pilot's narrative. Here Coote relates details of a recent post expedition conversation with Mr. Roberts, assayer and metallurgist, and apparently Lasseter's business partner, who decides, "that the peg Lasseter placed in the waterhole was the real key to Lasseter's Reef. This was the waterhole where he had replenished his water bags just before discovering the reef (in 1897), it was from this waterhole that Lasseter and Harding rediscovered the show, (in 1900), that peg was his indication peg declared Mr. Roberts". Roberts is referring to a page from Lasseter's diary that appears in Idriess's book, where Lasseter describes photographing the datum peg for the reef, on a quartz blow in a waterhole. Of course Lasseter doesn't say where the waterhole is, but after a discussion with the aerial explorer Donald McKay, Roberts concludes that the all important rockhole is within eight miles of McKay's 1933 encampment at Docker Creek. 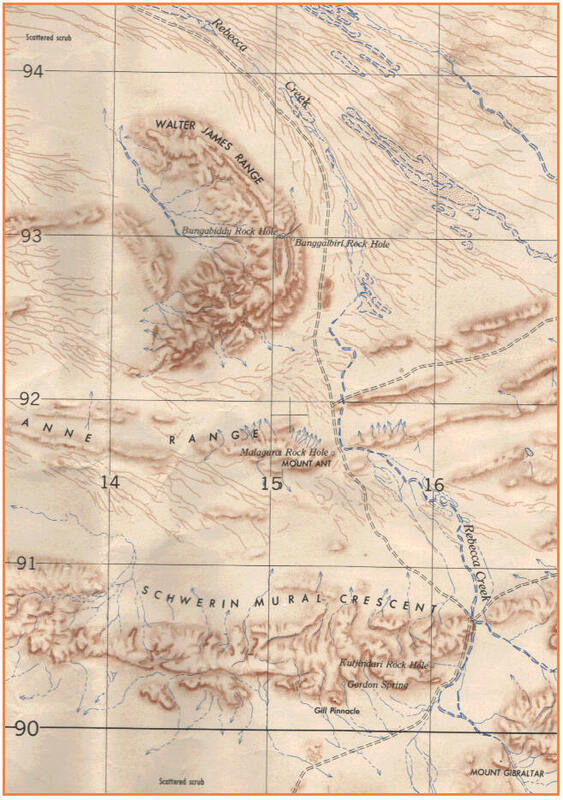 Coote does not elaborate on Roberts reasoning, and accepts the conclusions of Lasseter's business partner uncritically, as does Stapleton, who has examined the large scale survey maps of the Docker Creek area for likely waterholes within eight or so miles of McKay's 1933 encampment and names two possibilities. Banggalbiri rockhole, eight miles to the northwest and Malagura rockhole, twelve miles to the west. Stapleton decides that any travellers through the area would traverse the foothills of the main range where there would be a reasonable expectation of finding water, rather than risk Banggalbiri rockhole in the isolated and desert bound Walter James Range. Therefore, Stapleton 'prefers to believe', that Malagura rockhole is the base that is two days camel ride from Lasseter's reef. By this tenuous route Stapleton arrives at that all important rockhole, his conclusions ignore and contradict Johns accounts, unreliable as they are, and Lasseter's two day walk has become a five day camel ride to and from the reef. Based on thoroughly discredited sources, unsound reasoning, and some unfortunate misquoting, Malagura rockhole has gained a reputation as a place of some significance in the affairs of Lasseter and Johns. To summarise, Johns is the only source for the detail of events in the Petermann Ranges, and he never committed himself to writing regarding incidents or locations, besides would you take the word of someone, who ten years later, was arrested in London as a Nazi spy, and may well have been one of the founders of the Nazi Party in Australia?. Map©. Geosciences Australia. Maps of Australia - Geoscience Australia Reference, Series R502 Edition 1 AAS. SG52-2. RAWLINSON. Coote E.H. Hell's Airport 286,287. Stapleton Austin Lasseter Did Not Lie 39-42. Clacherty Desmond R. On Lasseter's Trail 31,32. Marshall-Stoneking B Lasseter the Making of a Legend 126, 136-138. AUSLIG SG52-2 Edn. 1-AAS.